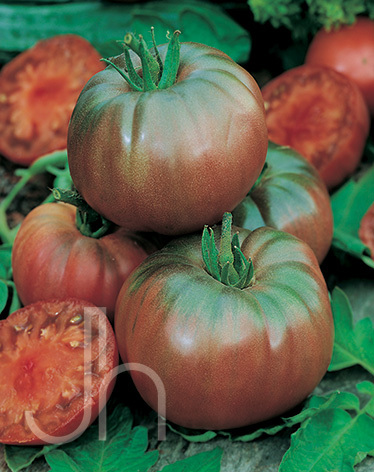 If you think Black Krim is a strange name, try Czerno Krimski. Do you have a guess as to where this odd tomato comes from? If you said Russia, then you are correct. The Isle of Krim is located on the Black Sea where this medium sized, indeterminate tomato originates. Black Krim heirloom tomatoes have a reddish almost black coloring on the outside and are reddish on the inside with green gel around the seeds. If you are on a low-sodium diet, these are the tomatoes for you because they already have a salty flavor. Outstanding Features: Color gets darker in warmer weather. Click here to buy Black Krim Tomatoes direct from www.buygardenvegetables.com.